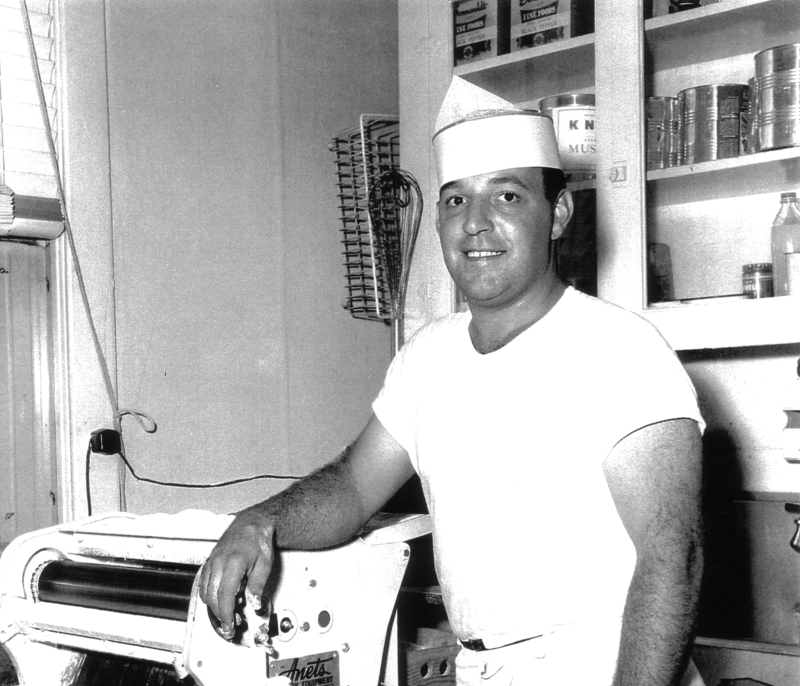 Gus Fricano in the 1950's. The original and current Fricano's Pizza Tavern in Grand Haven, MI. Cosimo (Gus) Fricano was the third child born to Antonino and Philipena Fricano, immigrants from Palermo (Bagheria), Sicily. After many years of toiling in the mud of the celery fields for his father’s cousin, Carlo Fricano, Gus and his younger brother Thomas enlisted into the Navy to serve their country in the Second World War. Gus claimed if it wasn’t for the war he may never got out of those celery fields. Once the war was over the brothers came back to the civilian life in good old Grand Haven, Michigan. Tom went to work for the Gardner-Denver Tool Company and Gus became a bookkeeper for the Jolly Dairy Milk Company. After about a year of working for the Jolly family, Gus knew he had to go into business for himself. Gus had an old saying (one of his many) "you never get rich working for someone else." Back then this was very true. He saw where the old Ottawa Tavern on the eastside of the city in amongst all the factories was for sale and asked his Uncle Curly (Cosimo) if he could borrow $2800 to buy it. Uncle Curly reluctantly obliged, and on August 21, 1949 Gus bought the Ottawa Tavern and soon renamed it Fricano's Tavern and from there, launched one of the most famous little success stories West Michigan has ever known. The going was tough right from the start, and tough would be a good description of the kind of crowd Gus bought into. He knew what he wanted and rowdies were not going to be part of the formula, so Gus had to be strict with his Tavern policy and soon he had made it very clear that troublemakers need not enter. The food on his menu was all prepared by his mother and it consisted of chicken to chili to "pasta en sugo" (spaghetti and sauce). Something different every day for his hungry working-class patrons to eat for lunch or dinner with a couple of beers. The food was good and the conversation was lively but the sales weren’t very strong and Gus knew he needed a boost, but what would it be. Meanwhile Brother Joe (who originally joined up with Gus) decided he wasn’t interested in being Gus’ partner anymore, so Gus asked Tom if he’d like to join up and Tom agreed. It wasn’t long after that Gus and his good friend Ray Harz traveled to Chicago to watch the Cubs play baseball. Across the street from Wrigley Field Gus noticed a sign promoting pizza, and there the light went on in Gus’ head and on the way home he told Ray that he was going to try to buy some pizza ovens and Ray had no clue what Gus was talking about. After a long discussion Ray finally decided Gus was crazy but that didn’t dampen Gus’ enthusiasm for his newfound idea. Next, he had to approach his mother and request her expertise in preparing his pizza recipe and she and Gus’ dad said "Cosimo, you must be crazy. Americans don’t want a pizza, that is food for paupers. They are rich, they want steak, not a pizza pie." Gus persisted further and eventually got his mother to agree to help him in his quest for the perfect tasting pizza. 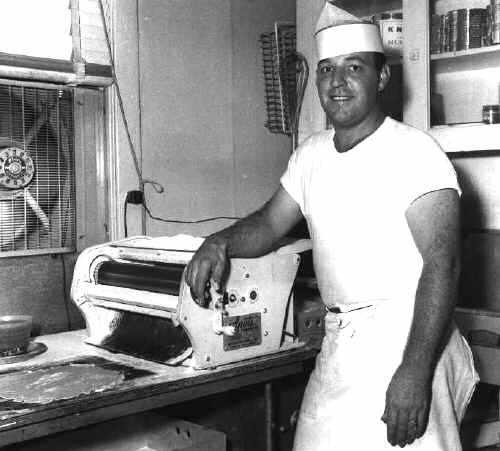 Finally in the summer of 1951, after many taste tests from Gus’ good friend and neighbor Ween (Larry) Berg, who swore if he had to sample one more pizza he’d explode, the finished product was ready for the general public to try. 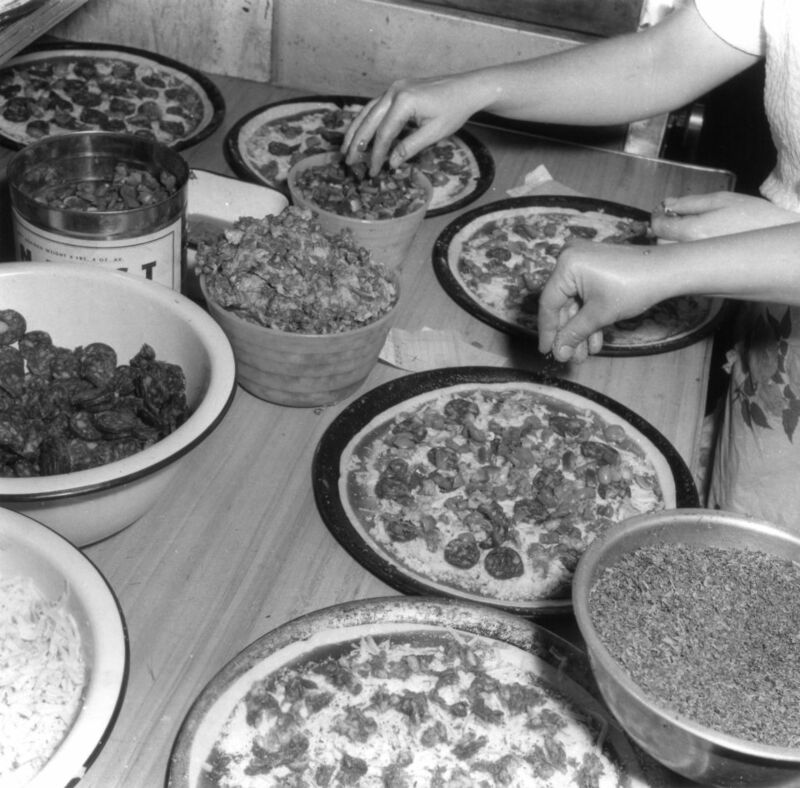 Making the original Fricano's Pizza in the 1950's with the same ingredients and cooking pans used today. In the lower right of the picture is a bowl of bird seed. "Gus, what the hell is that smell," was a common remark when the ovens fired up for the first few pizzas Gus ever baked. "Just try it and tell me what you think," he’d politely ask his patrons. NO ONE knew what pizza was back then. People didn’t even know how to say it; they had to spell it out to Gus so he knew what they were talking about. Gus said he gave more pizzas away the first year than he sold because nobody knew what it was they were buying. But that all started to change as word spread about this new thing called pizza served over at the Fricano's Tavern as the pizza sales went from a couple of dozen a week to the current figures of 3000 per week during the peak months of the summer. 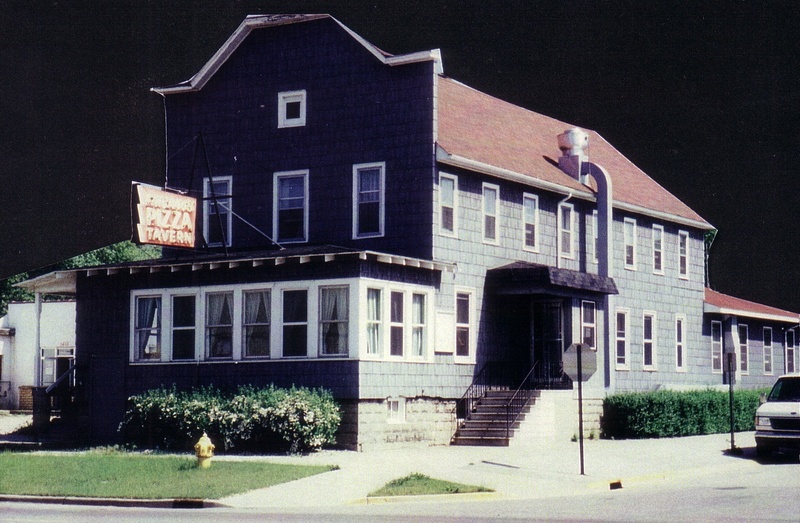 The record night at Fricano's was July 3, 1994 when that little old boarding house turned tavern pumped out 1200 pizzas in one night. It’s normal to average 750-850 pizzas on any given night between Memorial Day to Labor Day. But this is not just a summer phenomenon. 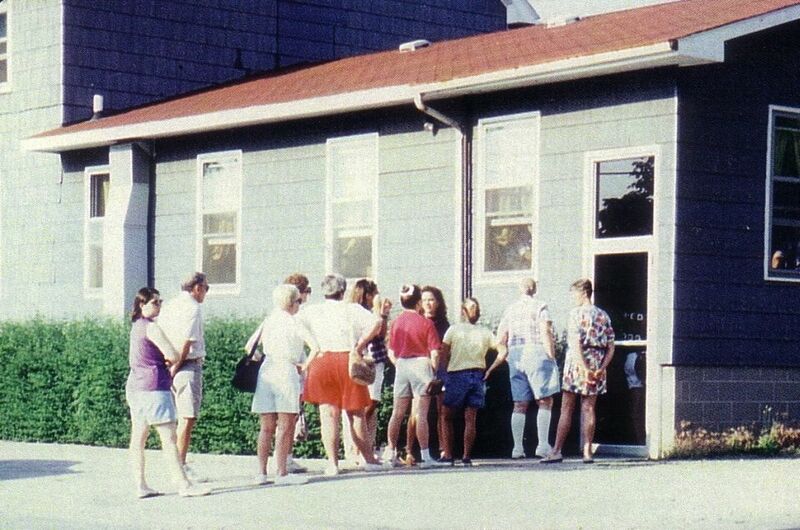 People craving this pizza delicacy line up at the door at Fricano's just about every weekend of the year, regardless of weather conditions. Freezing temperatures or rain does not prevent the Fricano faithful from standing at the doors at both ends of this 110+ year-old building waiting for the next available table to clear so that they may be the next group to be seated. Can it really be all worth it? Ask anyone who has ever indulged into one of these legendary thin crust beauties and the answer will be filled with nothing but the highest praise and adoration, they are that good. An uncooked frozen pizza from the 1950's with instructions to cook at 500-550 degrees F.
There was a time when Gus Fricano actually had a frozen pizza business. He sold to retail outlets and other pizzerias. Business was growing so fast he couldn’t keep up with it. He asked his family to help and no one was interested, so he said they could just have the business as their own and still no takers. Gus finally decided to just let the frozen business go so he could devote his entire attention on his Fricano's Pizza Tavern, which always came first. Fricano's at the present boast 6 locations. The Grand Haven, MI location known as Fricano's Pizza Tavern was started in 1949. The second one to open in 1978 was the Kalamazoo, MI location known as Fricano's of Alamo (The township it is in, just outside Kalamazoo.) This location serves dinners other than pizza (a complete menu and fine dining) and they offer more than the original 5 toppings (the other toppings they offer are ham, onions, black olives and green olives.) 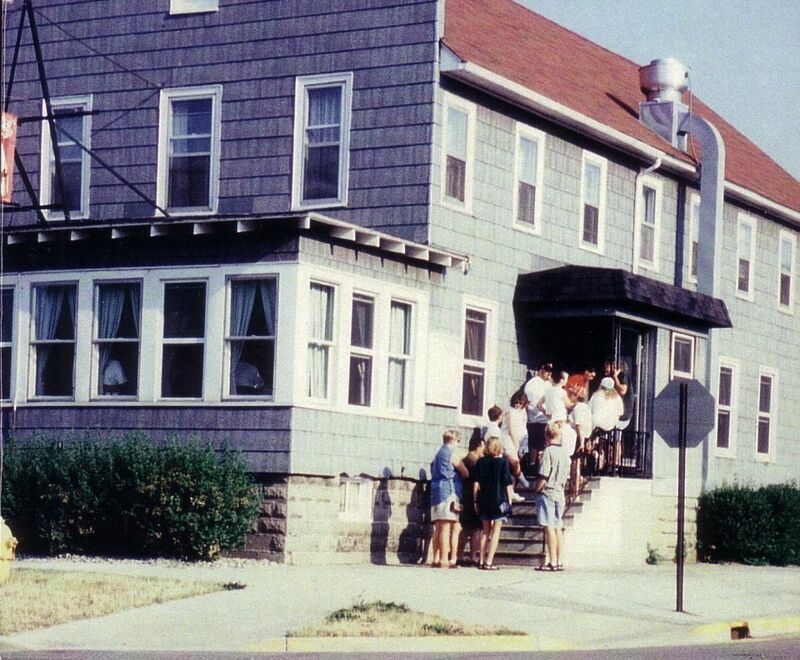 The Holland, MI location opened in 1983 called Fricano's Too. 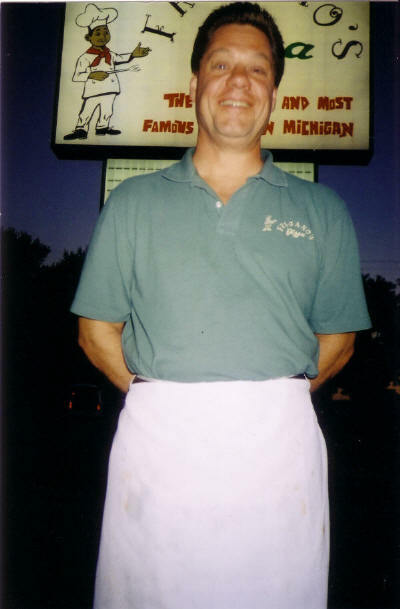 In 2002 the Muskegon, MI, Fricano's Muskegon Lake. Doug Fricano opened 3 Grand Rapids, MI locations, Fricano's Riverside Pizzeria (since then it was closed in September, 2006 after success and serving its purpose well) and Fricano's Bagheria Pizzeria (also since closed in July 2006 after success and serving its purpose well) and then the Comstock Park location in 2003 called Fricano's Pizza. Fricano's of Caledonia is the most recent and opened in 2014. In February 2013 Douglas Fricano was proud to announce the 10 year anniversary of the most recent expansion to the Fricano Pizza chain. Fricano's Pizza Restaurant located at 5808 Alpine Ave., NW in Comstock Park just a few miles north of Grand Rapids, on M-37 (Alpine Ave.). It's the site of an old Mr. Fables hamburger joint but it transformed into a Fricano's Pizza very nicely. Everything is in place for its patrons to enjoy the delicious flavor of the "original and most famous pizza pie in Michigan". Customers are overwhelmingly happy and satisfied with the new look and the continued good service and flavor of the new place. Nestled in amongst the largest apple belt of Michigan its a comfortable drive from anywhere in the Grand Rapids area. Doug is also getting rave reviews on his simple but delicious Mediterranean salad and the specialty pizzas he added to the menu. Make for a happy and satisfied outing, visit this or any of the Fricano Pizza parlors for the best pizza you have ever had. 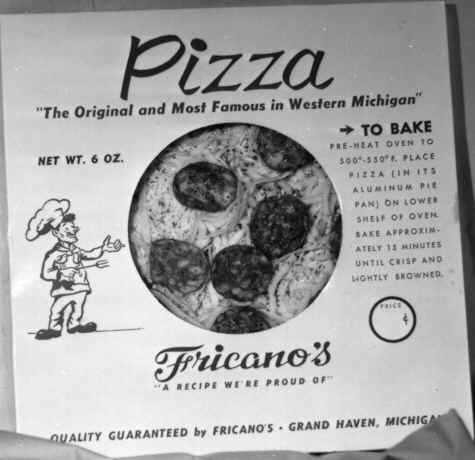 Fricano's Pizza in Comstock Park was established in February, 2003 and serves the same original thin crust pizza pie made famous in Grand Haven in 1949.